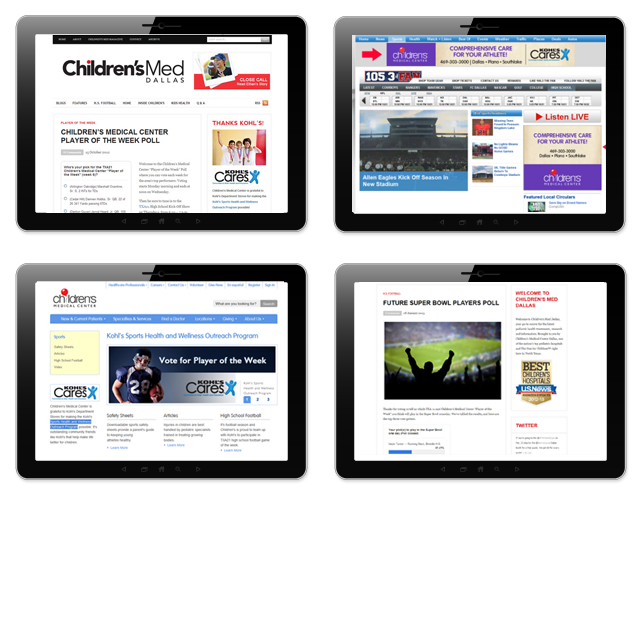 In 2011 Children’s was offered a sports marketing relationship with CBS Radio DFW. The challenge was how to use this relationship to serve the community and support the hospital’s strategic goals. A fully-integrated brand marketing campaign was developed that included internet, television, radio and face-to-face contact with families, athletes and schools throughout North Texas. The partnership with CBS Radio DFW was successful and was renewed annually. Sports safety tips and clinics were provided to the North Texas community and the hospital’s services and specialists received widespread coverage. The 2012 campaign (15 weeks) generated more than 30,000 visits to sports-safety blog posts. The 2013 campaign (15 weeks) generated more than 80,000 visits to sports-safety blog posts.